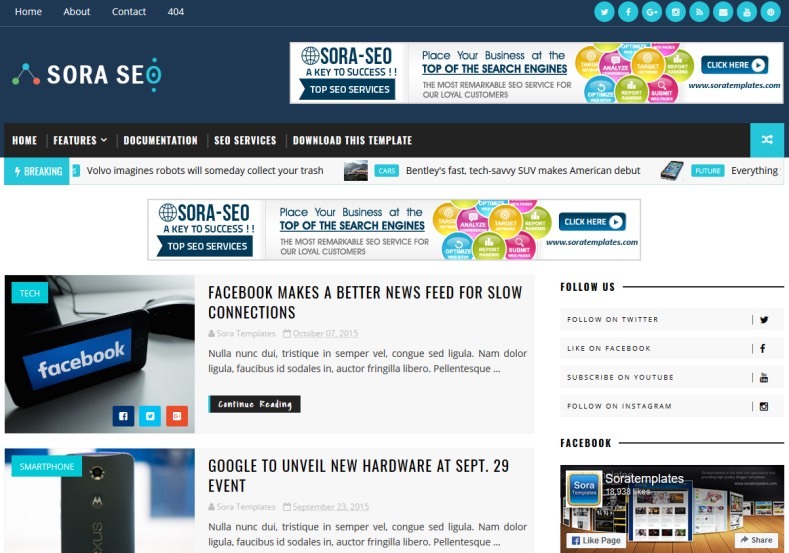 SoraSeo Blogger Template specially designed for blogs about news and tech magazine. Thsi template best choise for build news, technology and magazine blogger blogs. Breadcrumb Navigation Ready, News, Page Navigation Menu, 3 Columns Footer, Tabbed Widget Ready, Slideshow, Business, Blue, Ads Ready, White, 1 Sidebar, 1 Right Sidebar, Clean, Seo Ready, Magazine, Free Premium, Right Sidebar, Post Thumbnails, Responsive, Social Bookmark Ready, Drop Down Menu, 2 Columns.